None of us likes to face the fact that our fur-child is fat. The scales have crept up, he’s not as active as he used to be, sometimes struggles to join in the family fun… But he’s just chubby (and so adorable) and we love him regardless. That’s okay, right? 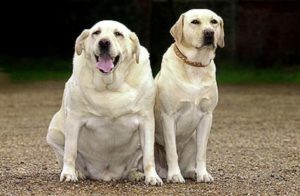 Yes, both dogs and cats can become diabetic as a result of carrying excess weight, and with 2 out of every 3 pets found to be overweight or obese at their veterinary check-ups, this is becoming a growing health problem! While diabetes is by no means a death sentence if caught early and treated correctly, it’s a challenging condition to manage. It is easily avoided by keeping your pet at an ideal weight. Our bones and joints are what hold us up, so to speak, and any extra weight having to be supported puts pressure on the joints in particular. Fat deposits have also shown to release pro-inflammatory agents. Excess weight can dramatically increase the risk of your pet developing joint inflammation and osteoarthritis, an exceptionally painful , permanent and ultimately debilitating disease. Such is the prevalence of this condition, particularly amongst large and giant breed dogs and cats, that veterinary orthopaedic surgeons actually recommend keeping these animals very lean, even a bit “ribby”, lifelong. Equally at risk are breeds with oddly-shaped skeletons like dachsunds, bassets, munchkins and bull-dogs. Carrying even 5% excess weight can significantly affect your pet’s quality of life and life expectancy. Being overweight or obese causes strain for all the organs, but particularly the heart, which has to pump blood through loads of extra tissue. Fat accumulates around all the vital organs, limiting the space for the heart and lungs to function. The result: it literally “wears out”. No-one wants to see their pet feeling listless and lethargic, suffering fainting spells, at risk for heat stroke or battling to breathe normally. However, if you allow his or her weight to burgeon, this is exactly what is likely to happen. 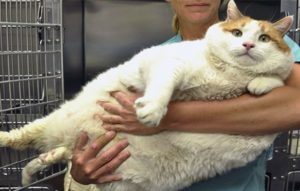 Overweight animals develop rolls of fat, just like plump humans do. These folds provide ideal breeding grounds for bacteria, resulting in a host of uncomfortable, itchy and oozy skin irritations. Of particular concern are the areas around their “girl- and boy-bits”, where urine may accumulate and cause, not only discomfort, but serious infections, as the bacteria migrate up into the urinary system. Added to this is the fact that, like an overweight person who can’t touch his toes because of his voluminous girth, fat animals can’t groom their bodies properly, purely because they can’t reach! 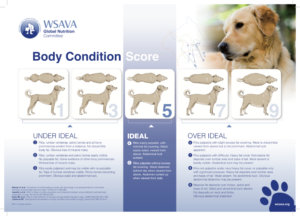 Possibly one of the most concerning factors is that a dog or cat who is over his or her ideal body weight becomes an anaesthetic risk. This means that if your pet ever has to undergo emergency surgery, be it due to being hit by a car, breaking a bone, or suffering an illness which requires surgery, the likelihood of them running into serious problems under anaesthetic, or even passing away, is dramatically increased as opposed to an animal of healthy weight! Individual ribs should not be seen sticking out, but should be felt easily under the skin with medium finger pressure. Each rib should be definable; if not, and all you can feel between your hand and the bones below is a cushion of fat, your pet is most certainly carrying excess weight. How much, exactly, will be determined by a proper Body Condition Score. When viewed from the side, there should be a definite “tuck up” of the abdomen from the lowest part of the chest to the groin. If this area resembles a droopy pouch rather than a lean upward “scoop”, yup, you guessed it, you have a loveable fatty on your hands! 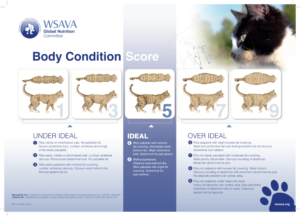 It’s obvious that calories will need to be reduced and portions controlled, and there are a variety of superb veterinary-formulated weight management diets available to reduce both your pet’s weight and the stress for you. Depending on how much he or she needs to lose, your vet or TW Team member will recommend either a “Lite” food or a prescription weight reduction formula. These special calorie-controlled pet foods are based on cutting edge nutritional science – they not only provide all the nutrients your chubby pet needs, despite cutting down on fat, carbs, etc., but some, like the Hills Prescription Diet Metabolic range, are formulated to make changes at a cellular level; they literally turn your pet into a “fat burner” instead of a “fat storer”! 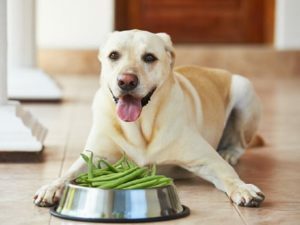 Unfortunately, just cutting back on your pet’s usual diet is ineffective, as an overweight body is geared to survive on very little food. Also an imbalance of essential nutrients can result from simply feeding your pet less of the food that helped cause the problem. Everyone in the household needs to be aware of the seriousness of your pet’s weight problems, most especially the health risks of not slimming down. All too often there are one or two “culprits” in the family (or staff), who “feel sorry” for Fat Felix or Roly Rover and sneak him treats on the sly. Everyone needs to be committed to helping your pet reach goal-weight and feel amazing. Ensure that portion control is exercised by everybody who feeds your dog or cat – draw a clear line on the plastic measuring cup, or even cut it at the exact level if someone is inclined to be a little “heavy-handed” when dishing out. Just because your pet can’t indulge in his favourite peanut butter bed-time cookie anymore, doesn’t mean he can’t have treats or rewards. Dogs enjoy some vegetable matter in their diets and carrot or apple, for example (grated to prevent choking hazards) are fantastic low-calorie snacks which can be offered in between meals to stave off the hunger pangs, be they real or psychological… yes, your pet can “think” he’s hungry too, purely because he’s accustomed to getting a second or third breakfast mid-morning …. The weight-loss veterinary diets also have a treats available that fit into the diet plan. Remember that not all treats need to be food treats. Most cats get a serious kick out of some catnip sprinkled on a favourite toy or scratch post, and any kind of activity that involves spending time with the family will be welcomed by dogs. Think walks, visits to dog parks, etc. where your dog can be active too, rather than just chilling on the couch with you, watching telly. While exercise is a vital aspect of any weight loss programme, remember that your overweight pet may already be suffering from sore joints, breathing problems, etc., or simply be battling to drag the extra pounds around as it is. Start by introducing gentle exercise, even if it’s just a slow amble around the garden or the block, or a short game of fetch with a favourite toy. Engage cats in short but regular games of chase (find out which type of toy takes your feline’s fancy – laser pointers and feather wands are usually winners). Energy levels and stamina will quickly improve as the weight comes off. Whatever you do, don’t allow your pet to lie around all day like a sack of potatoes. Keep in mind that he might be doing so because his limbs are sore, but encourage him to get up and move around regularly, even if just for a few minutes each time. As your pet’s fitness increases, get them moving up and down the stairs too. 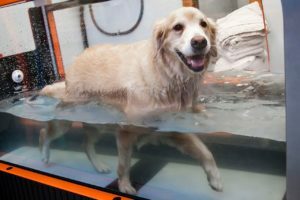 Finally, swimming and walking on an underwater treadmill are incredible forms of exercise for overweight or obese pets. They alleviate all stress on the joints while burning loads of calories. A number of veterinary clinics and animal hydrotherapy facilities offer these treatments and most pets grow to love them; cats and some dog breeds are “swum” in special safety harnesses and they, too, can benefit greatly from these exercise treatments. 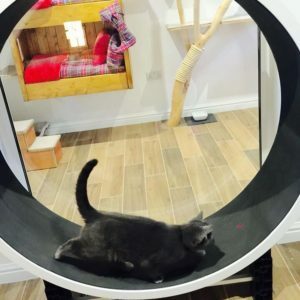 Don’t despair if your favourite furball has packed on the pounds – your vet or trained Twisted Whiskers weight management advisor will be eager to provide you with all the support you need to help you slim down your portly pet. A number of excellent slimming programmes offer great prizes for “the biggest losers”, as well as all sorts of offers and discounts to help make the process fun and rewarding, both for you and your pet. Visit us today for your free pet weight assessment. Previous: Previous post: PET FOOD – FEASTS, FEARS AND FADS?